In my book, Dear Teachers, I wrote the following essay focusing on the walls students construct. I felt the need to look at it again today in regards to the everyday living of all people. You, me...everyone. Faces are walls. Barricades. Facades. We all build them from time to time and to varying degrees. It feels safer to hide. Some of the students we meet have epic skills in this, honed by years of experience. It is perhaps the teacher’s most challenging task to massage these walls and tease out the mortar and stones that have been used from abject need. We all want to survive; for many, a constructed face is an effective, if crude, way to do that. We do it as field triage in moments of hardship and necessity. Unfortunately, it’s a pattern of behavior that can be carried into and throughout adulthood, affecting all facets of our lives along the way. If we hide long enough, the act becomes the actor’s reality. The effective cocoon clasped so tightly around the genuine heart may eventually suffocate the very thing we sought to protect in the first place. We are then left a weakened shell, like an oak whose heartwood has been consumed. 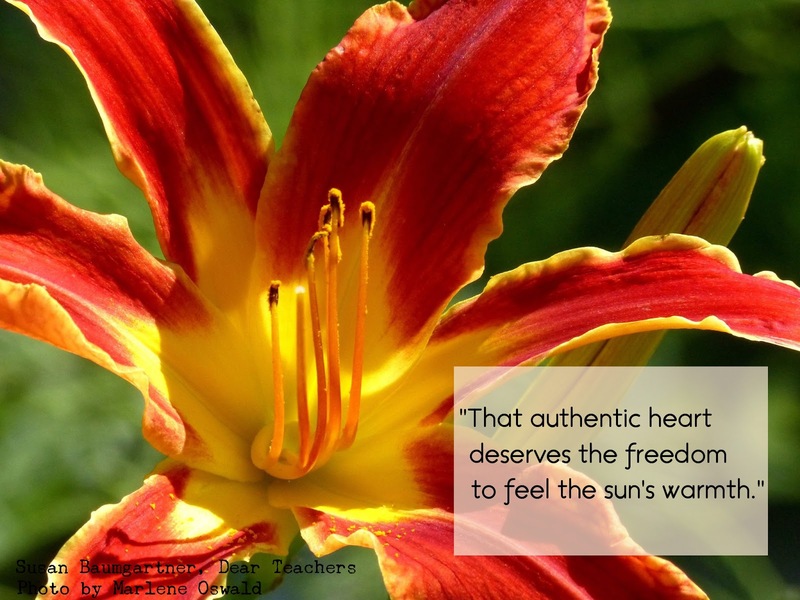 That authentic heart is the unique and golden center of Self. It deserves the freedom to feel the sun’s full warmth." "I just finished writing a big essay on my main blog, called Spring and the Death of Denial. It was in response to a fantastic conversation on a philosophical radio program called On Being. Now, I’m hopping back into Dear Teachers, and am struck by how this week’s essay, the last of the April focus on what’s really there, connects to that. In this week’s essay, the image from Marlene that I chose was a close-up of a lily in full bloom. The center of that flower is bright yellow, while the outer edges are a deep red, trimmed in that same golden hue. We don’t get to see the full complexity of that bloom until it really opens up. How can we get ourselves blooming like that? How can we get each one of our students to bloom like that? The walls that separate us from both our true selves and from each other have to come down. I wrote, “If we hide long enough, the act becomes the actor’s reality.”. By that I meant that every single one of us is affected by all these walls we build. If I don’t reach out beyond the walls I was born into or have built myself, I miss out on understanding the real beauty of both myself and others. Others miss out on my gifts. We both are lessened. We’re like the bud in the background of Marlene’s shot: there, but not yet gorgeously exposed. As Rev. williams pointed out in her talk, this work is hard. Sitting with who and what we really are is tough. But, in my mind, it’s critical to getting our world’s garden to really bloom." The Nathaniel Hawthorne quote claims that no one can truly lie to themselves to the very end. From our perspective, some people appear to never sway from their own sense of reality, safely encapsulated within their constructed fortresses. I find solace in Rev. angel Williams kyoto’s thoughts that even the “winners” in unfair situations are suffering from the very systems they’ve benefited from and cultivated. Those behind castle walls are not truly free. I can see such truth, if begrudgingly, in that. My thoughts and writing here came from a hopeful opinion that we all start from a child-like, wonder-filled place. It’s what we face from madly ego-driven minds that damages and alienates us. If society is set up to support the child-like spirit, the need for walls will get less and less. If we set things up to allow all hearts to bloom, we will all benefit. To reach a place where the child-like can thrive will require extremely hard work. Some have begun, and the tools are out there for all to pick up.